Yesterday as I was preparing the juice for our get-together my thoughts were, “Cut the sugar!” That was because of all the research I read that said – sugar feeds cancer. When we celebrate a birthday, anniversary or even now as we are celebrating the launching of our new website, I will want to bake & ice a cake. One difference today is that I will start adding some nutritious ingredients & replace some of the less nutritious ingredients. That is what I did for this website celebration. The following cake recipe is from a small cookbook I named “Party Cakes” but one I never did publish just because it needed to have lots of colored art work and drawings. I took out some of the sugar, switched the margarine to butter, used unbleached flour instead of bleached and used kefir instead of milk. I made quite a few changes and yet the result was still so moist and fluffy.I will often use sifted freshly ground spelt flour instead of the bought unbleached flour as well. WHITE CAKE – bake in 2 – 9 inch round cake pans. Cream butter and sugar well. Add one egg at a time, beating between. Beat in vanilla. Mix the dry ingredients with a wire whip and add in 3 parts with half of the kefir between each addition. Spread in the greased pans. I put wax paper at the bottom so they are easy to remove after baking. When cold, put the layers together with part of the icing and then cover the whole cake with icing. I save a half cup of the white icing to mix with food coloring so I can decorate the cake as I wish. Or one can mix all of the icing with a color if that is what you want. With a wire whip, mix the flour with milk until smooth. Microwave 1 minute, mix with a wire whip, then heat again if not quite thickened. Whip it until smooth. Let cool off. Beat the butter, sugar and salt together until light and fluffy. Add the flour mixture a little at a time, whipping well after each addition. Add the vanilla and whip once more. Remove a small portion of the icing & set aside to use later to decorate. Use the rest of the icing to fill the two layers and then to ice the top and sides. 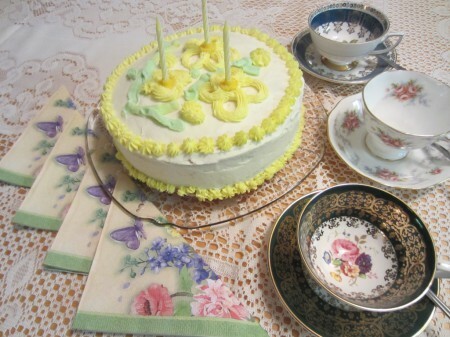 Color the saved portion and use a cake decorator to add edging, flowers of other special effects.